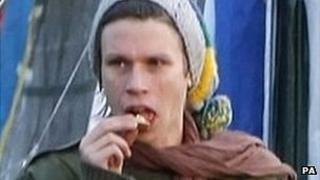 Image caption Lauri Love, arrested in Suffolk, has been released on bail until next February. A 28-year-old British man has been arrested on suspicion of hacking into US military and US government computer systems. Lauri Love, arrested in Suffolk under the Computer Misuse Act, has been released on bail until next February. The US authorities claim he placed "back doors" in hacked networks to steal data. The arrest was the culmination of a joint investigation by the UK's National Crime Agency and the FBI. According to the US authorities, the arrested man hacked into systems of the US Army, Nasa and the Environmental Protection Agency, among others. He has been charged in the US with accessing a government computer without permission. US authorities, including the army, allege that information accessed included budgets, the disposal of military facilities, and personal information on thousands of people, including military personnel. Mr Love, from Stradishall, Suffolk, is accused of working with at least three others, who are not named. The alleged conspirators are said by prosecutors to have chatted online in secure web forums to identify targets, then hacked into thousands of computer systems. The suspected hackers allegedly placed "back doors", or code, to allow them to get back into the systems later to steal confidential information. The high-profile arrest is the latest in a series that have involved the UK's newly formed National Crime Agency. Last week the NCA launched a campaign to recruit up to 400 trainee cyber and intelligence officers.